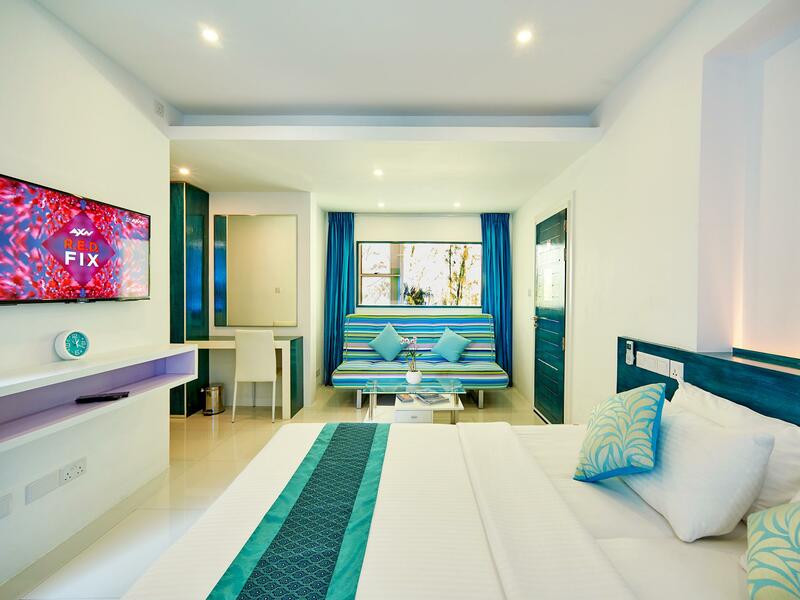 "Great location for getting to Male by ferry or car and also..."
Have a question for Planktons Beach Hotel? "Breakfast at the beach is nice"
"Transfer from airport to hotel is smooth and a 10 mins short journey." "My friend and me are so lucky to book this hotel and so glad to meet the wonderful staffs." 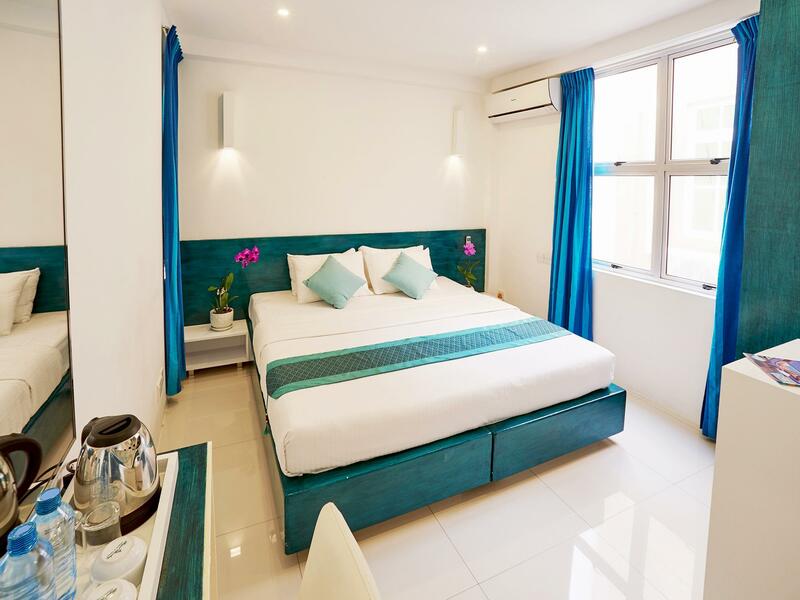 "This is a great little hotel for a night on your way to the..."
For travelers who want to take in the sights and sounds of Male City and Airport, Planktons Beach is the perfect choice. 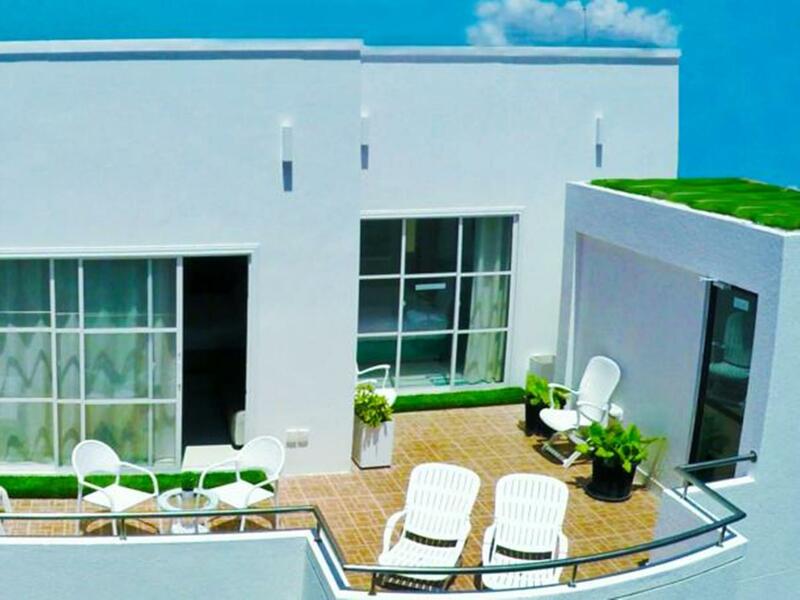 Only 1.4 km away, this 3-star hotel can be easily accessed from the airport. With its convenient location, the hotel offers easy access to the city's must-see destinations. 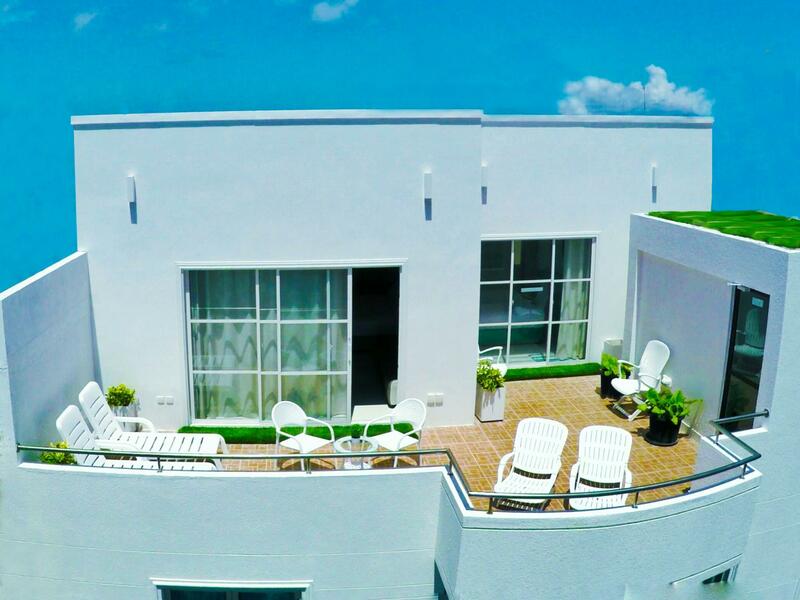 Take advantage of a wealth of unrivaled services and amenities at this Male City and Airport hotel. The hotel provides free Wi-Fi in all rooms, 24-hour security, convenience store, daily housekeeping, portable wi-fi rental to ensure our guests the greatest comfort. 6 rooms spread over floors provide a warm and pleasant home away from home. 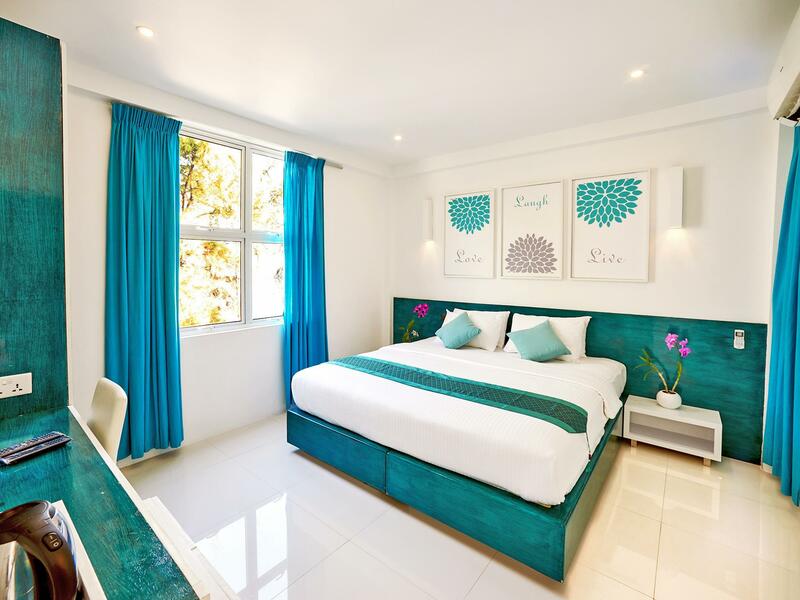 Modern comforts such as television LCD/plasma screen, bathroom phone, clothes rack, complimentary instant coffee, complimentary tea can be found in selected rooms. The hotel offers an excellent variety of recreational facilities, including boats, canoe, watersports equipment rentals, wind surfing, snorkeling. 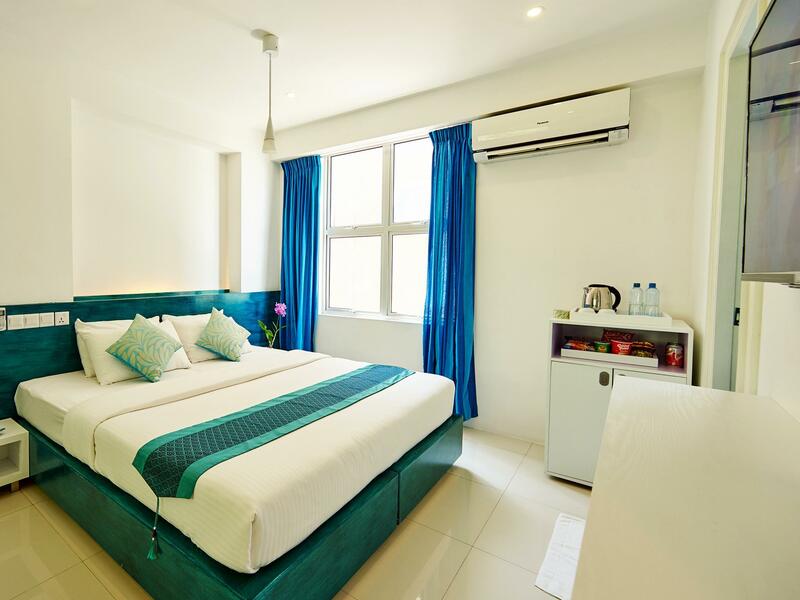 When you are looking for comfortable and convenient accommodations in Male City and Airport, make Planktons Beach your home away from home. For over 200 Dollars a night we got a basic room, no breakfast, no free transfers, slow internet and TV with just 1 English Channel (CNN) - it didn't seem like great value to me. The positves were friendly staff & good location opposite a beach but it's hard to justify the cost. I only stayed at Plankton Beach Hotel briefly, arriving late and leaving early. The room was clean and the AC worked well. The staff were efficient and organised a pick up for me to go to the airport. Location on sea side with nice sea view . Breakfast is taken on the beach which is great. The beach is an artificial one but very nice, clear and white sand and long beach very safe too as there is a coral reef 100 meters far from the shore. Only constraint: no bikini allowed and a lot of jet skis driving along the shore. This is a great option for a transit stopover on the way to resorts in the Maldives. A new area with some good beachside cafes, this is a comfortable spot to start and end a trip. Helpful service including transfers to and from the airport. Hi Craig, Thank you so much for your wonderful review and description of the area. we would love to see you again in the Maldive .. Thank you for the room upgrade! Hotel was clean and the manager was very friendly. Breakfast is good too. can be served by the beach. Just a minor hiccup when we arrived at the airport. No pick-up was available because they were not replying for my pick-up request in their facebook page. but when we called them up via landline at the information counter, they arrived in less than 20 minutes. A modern inspired, beach front, clean hotel. Good location just 10min from the airport and walking distance to ferry terminals. The hotel staff Ameen is very helpful and accomodating. We all had a pleasant stay at Planktons. Stayed at Planktons just for the one night while transiting to our main resort - this is common when visiting the Maldives. Some small confusion with the airpot transfer when we initially landed but all resolved. There isn't too much in the area surrounding the hotel (it's actually on a separate island to Male itself) but we did find a pleasant enough restaurant on the evening we landed. Hotel itself is pretty modern. We had a small but nice room on the top floor, with breakfast served in a private area. There were no lifts, so for anyone with mobility issues, do bear in mind when booking. Would recommend as a one-night stay en route to a private island, which is really the main purpose of the hotel! I am so lucky to book Plankton beach hotel be my trip to Maldives. Athif is a very nice guy help me a lot b4 I arrived he is so responsible person to reply yr mail very quick. He pick up you in the airport with the hotel car. And the hotel is around 10 min from airport. When I check in the hotel room I find the room is very clean nice room face up the beach and the bed is comfortable. All decorations is model basic on the price this is a good deals to get what I pay for. Next to hotel is a beach bar and restaurant so if u hungry after arrived u can easily get something to eat at night. I am check out the next day to the private island resort , the staff is so smart to prepare the early breakfast in front of my room and Athif is just waiting for me to send me to the boats pick up . So I got everything smooth and helpful during my stay. That why I book again when I return back to Male from islands I found plankton is the only friendly hotel to add on my trip with a beautiful memory. Thank you very much to Athif he did a great job to help me check out the time to Eriyuda and explain me a lot about the island culture, I will be back to plankton to see my friend again here . Love u guy great job!!!! Our experience at Plankton hotel was not pleasant. When we arrived at the hotel, the reception worker didn’t smile nor gave us any basic information about the breakfast and other services. I had to ask every single thing. Plus he didn’t even look at me, he always looked other way. The rooms we got smelled bad, had mold in the bathrooms and there were old shampoos and gels. The sheets were dirty with stains and the towels were not only dirty but also had holes in them. The view both of our rooms had on a wall. The location is also not a good one. It’s quite crowded. Plus I can honestly say that this hotel is overpriced. We stayed at another hotel in Hulumale when just arrived to Maldives and that hotel was perfect and much cheaper. I chose this hotel because of the Plankton beach. We really wanted to see the Planktons at night but when I asked about it, he laughed at me and said, maybe sometimes. I’d like to notice that the only people that smiled were the manager and the bell boy. We booked this room for an afternoon/evening We returned from our resort island, but still had hours to fill in before our international flight home. This hotel is at a great location near the bus stop and beach restaurants across the road. We were located at the top floor, there is no lift, but the staff took our bags up and down the narrow stairs. Hotel was exactly what I needed. Transfer driver was really helpful. 10US dollar taxi ride from the airport. Staircase access only but the staff will help with your luggage . Overall is ok apart from a tiny dot of blood stain on the bedsheet. Staffs were accommodating when I was asking if the sport channel were available. Nice room, unfortunately the the view was blocked by those trees (not that it really matter, actually!) I would def come again sometimes in the future. The bed sheets already had sand in them upon our arrival and the bed sheets were dirty !! Which gave my husband an itch on his body the next day. Overall, the hotel was okay. It would be more suited for a one night stay. Hi Tan, Thank you very much for sharing your feedback, We would like to apologize for the inconvenience caused. We will discuss this issue with our team and management to improve our standard of service. Once again thank you for staying with us. We stayed 1 night, arriving at 11pm, departing at 6am. Travelled with 3 kids under 6, the management went out of their way to make our short stay great - really warm and genuine hosts. Would recommend if you want to stay near airport (10min taxi), all of which is arranged by hotel. Room clean and functional. Most of all, was the staff, really went out of their way to help. I stayed in Planktons Beach hotel for a night as my flight landed almost midnight at Male. Welcome drink upon arrival at the hotel. I find it more like an inn than hotel as the building is quite small. There are no lifts in the building but the staffs at the hotel will carry your luggage to your room so don't have to worry about the stairs much. I was given a free upgrade as i was told that the one i booked is kinda small for 2 pax. Thanks for the free upgrade! Room is not super clean but manageable. Room size is pretty okay for the price u are paying... Had to pay for airport transfer and no free breakfast included.. So might consider the price on the higher side for hotels in Hulhumale. No security safe in the room and no mini fridge. Something that can be improved. But overall not a bad experience. Beach is just opposite the hotel but water is not very clear. Nothing much to eat in the vicinity. bout 5-10 mins walk away from the marketplace and shopping mall area.